San Francisco, CA, PI (Physik Instrumente) LP just introduced a new generation of economical, miniaturized positioning stages with piezo-inertia motor drives at this year’s SPIE Photonics West conference. Linear and rotation stages are available in open and closed loop designs. The new LPS-22 series of economical mini positioning stages are driven by a compact piezo inertia motor. They are offered with travel ranges of ¼ inch, ½ inch and 1 inch. Featuring dimensions as small as 22x22x10mm, the LPS-22 is one of the smallest precision linear stages currently available on the market. Open-loop and encoder equipped versions are available enabling resolution down to 1 nm. The optimized piezo motor drive allows for push/pull forces to 3N (1/2 pound) and velocity to 10 mm/sec. The new linear stages can be combined to XY units and rotation can be added in form of the new RPS rotation stages. These ultra-low profile rotators available with diameters of 14, 22 and 32 mm and feature a profile height as low as 7mm. No adapter plates are required for mounting. Why PIShift Piezo Inertia Motors? The integrated PIShift type piezo ceramic inertia motors provide several advantages over classical motor drives: smaller, lower energy consumption, nanometer resolution and self-locking, i.e. at the end of each move, the stage locks its platform into place with no drift and no current draw. This provides better stability and removes the need for a motor brake. The stages are available in open-loop versions and with direct encoders for closed-loop operation. Vacuum and non-magnetic designs are also available. Several drive options from OEM driver boards to closed-loop servo controllers with USB interface are offered. Custom designs are also available. 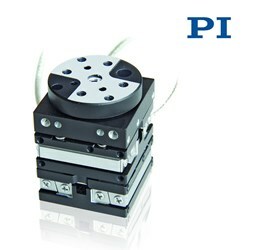 PI is a leading manufacturer of precision motion control equipment, piezo systems, piezo motors and actuators for photonics, bio-nanotechnology, medical engineering & semiconductor applications. PI has been developing and manufacturing standard & custom precision products with piezoceramic and electromagnetic drives for 4 decades. The company has been ISO 9001 certified since 1994 and provides innovative, high-quality solutions for OEM and research. PI is present worldwide with eight subsidiaries, R&D / engineering on 3 continents and total staff of 750+.